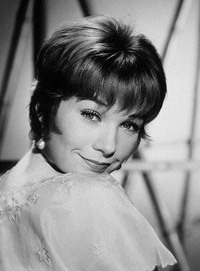 Shirley MacLaine's parents were both frustrated performers, her father a violinist and her mother an actress. Her brother is actor Warren Beatty. As a toddler, MacLaine was enrolled in ballet classes to strengthen her weak ankles, and about a year later at age 3 she appeared on stage for the first time. She got her first laugh when she tripped over a curtain. During the summer school break before her senior year in high school, she went to New York to try to get work as an actress, and ended up in the chorus line of Oklahoma! Reluctantly she returned home to finish high school, but came back to New York the next year, working as a sales clerk and model until she got another chorus line job. In true theatrical fashion, she understudied the lead in The Pajama Game, and took the role when the previous star (Carol Haney) broke her ankle. MacLaine's triumph in The Pajama Game was seen by a studio executive, who offered her a contract. Her first film was Alfred Hitchcock's The Trouble With Harry. After starring with Dean Martin in Artists and Models, she became the unofficial "mascot" of the "Rat Pack" (Martin, Frank Sinatra, Sammy Davis, Jr., and Peter Lawford). MacLaine has said there was no "hanky-panky" with the guys, and Sinatra reportedly called her "Kid". Her films include The Apartment and Irma la Douce, both with Jack Lemmon, The Children's Hour with Audrey Hepburn, Sweet Charity with Ricardo Montalban, Being There with Peter Sellers, and Steel Magnolias with Julia Roberts. She married early, to sometime moviemaker Steve Parker. He soon became uncomfortable being "Mr. MacLaine" and returned to Japan, where he had lived most of his life. They had an open marriage, and for years Parker and MacLaine rarely saw each other. Their daughter Sachi lived with MacLaine until she was six, when there was a "mafia threat" on the child, according to MacLaine. After that, she was raised by Parker in Japan. MacLaine had several boyfriends and lived with journalist Pete Hamill in the 1970s, finally divorcing Parker in 1983. In the early 1960s, under contract with Paramount, MacLaine was only making $15,000 a picture, but her movies were obvious hits. She sued Paramount, won her case, and began to command $500,000 a movie. She took a hiatus from movie making from 1970-77, returning as the ballerina who had given it up for a family in The Turning Point, which featured a famous catfight with Anne Bancroft. For 1983's Terms of Endearment with Debra Winger and Jack Nicholson, MacLaine won an Oscar. She was reportedly once groped by President John F. Kennedy, and commented, "I would rather have a President who does it to a woman than a President who does it to his country." MacLaine later became active in politics with Robert F. Kennedy's 1968 presidential bid. Also in 1983, her book Out on a Limb was published, dealing with MacLaine's foray into spiritualism and New Age practices. In her 2000 book Camino, she claimed to have slept with Holy Roman Emperor Charlemagne in a past life. She also described her visions of androgynous people bearing androgynous children, and revealed that she herself was androgynous.